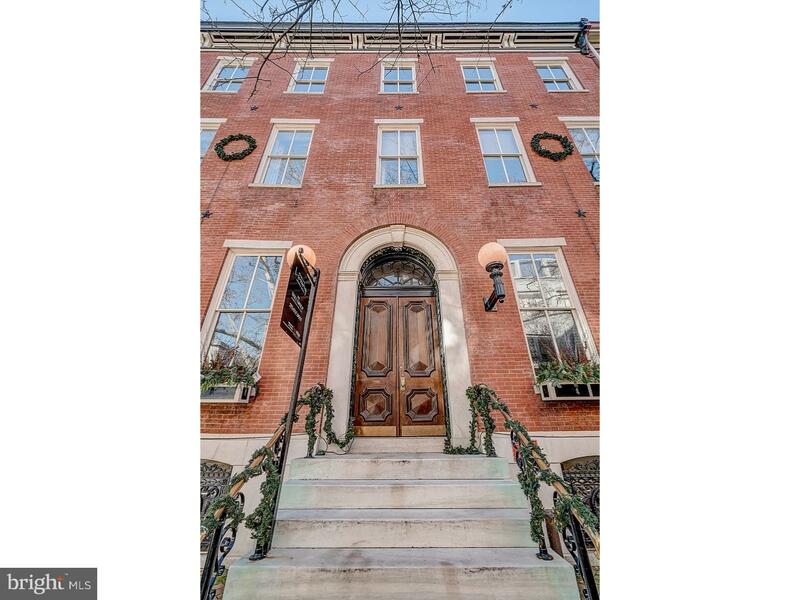 With palatial roots dating back to 1860, this remarkable Rittenhouse residence blends treasured architecture with contemporary luxury. Situated inside a lovingly preserved brick mansion on the historic 20th block of Delancey Place, this immaculate bi-level unit features 15-foot-tall ceilings that sail above the sunlit chef's kitchen, warm living spaces that are lined with oak wood flooring, 10-foot mahogany windows with custom wood shutters, and custom built-ins. The kitchen stuns with features like a Wolfe 6-burner gas cooktop and microwave, Carrara marble countertops, sub-zero stainless steel refrigerator and wine coolers, as well as custom Kahle wood cabinets. The kitchen beautifully flows into the main living area, which highlights a fireplace with a marble mantel and mahogany crown molding. There is a bonus powder room on the main living floor. The magnificent and modern staircase leads you to the two large bedrooms, which both include ensuite bathrooms with radiant floor heating. The master and guest suites are an oasis to relax and recharge, featuring a jet-soaking tub, steam shower, and grand walk-in closets. The master ensuite features a bidet. Samsung washer and dryer is conveniently stored between both bedrooms. Outside, the lush terrace offers space for entertaining and sky-gazing above an enclosed 1-car parking garage. You can also enjoy the finest dining, shopping and arts of Rittenhouse Square, just steps away. Can be purchased with or without parking. There are only 4 units in the building and 4 years left on the tax abatement. Come view this luxurious property for yourself today!